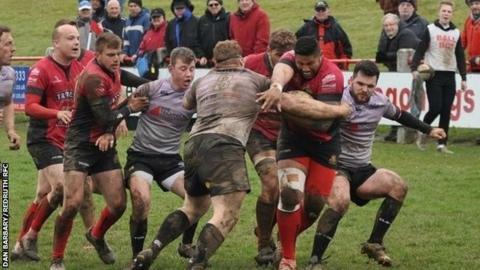 Redruth head coach Steve Larkins says he hopes to retain the bulk of his squad for next season. The Reds have impressed in National Two South this season, with the fourth-placed club just four points off third place with four games left. "We're already thinking about what we're going to do next year, what kind of player we're looking for," he said. "We want to keep this squad together because every player has contributed in some way and really pushed us." Larkins' side has lost just twice in the league since the middle of December and face four sides below them in the table in their run-in, starting with a trip to eighth-placed Old Elthamians. "We want to be in that that top two or three next year, if not pushing for that automatic promotion," Larkins added BBC Radio Cornwall. "But we can't get too far ahead of ourselves because things do change, players do change, and I know lots of teams in this league are recruiting heavily. "But keeping this team together would be really good and we're trying to keep as many players as we possibly can. "If you can recruit three or four into that squad as well you're going to be better again."